Two weekends after The Force Awakens came out in movie theaters in the United States, I found myself standing in a toy store, sighing heavily. I was on a quest for a lightsaber that was proving fruitless, but being made ever the more frustrating by what else I wasn’t seeing. “Aha! There she is!” I whispered as I finally spotted the name Rey on a box on the peg closest to the floor at the end of the aisle. As I got closer another sigh started to form. That peg held a single Rey dress-up kit featuring pieces of the character’s costume sized for a small child. This included goggles whose lenses were some sort of shimmery, glittery, not-appearing-that-transparent fabric. “How is a kid supposed to see and not scratch up their face while wearing this?” I asked my quest companion. “Guess they’ll have to use the Force,” he replied with a chuckle. We would end up going through no less than six different stores that weekend as part of our quest. And in those places I saw Rey on the cover of a few books, one of several characters featured on two separate Valentine’s Day cards sets with awkward messaging, and in the form of one other solitary toy on its peg – tiny, faceless Rey with her 3.75 inch speeder bike. I would eventually check out the Disney Store too and what I found there – well we’ll get to that. In the non-Disney-owned stores Finn and Kylo Ren were highly available. BB-8 and Darth Vader were both a close second. That first toy store actually had about twenty 4-foot-tall Darth Vaders and another twenty similar First Order Stormtroopers. Did all these places have stock of Rey merchandise when the movie debuted and it all immediately sold out? How much of it was there? Or was it not there when the movie came out at all? It’s hard to tell. 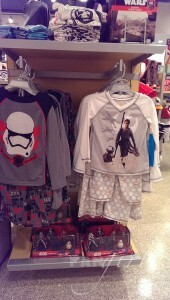 There is no doubt there has been Rey merchandise. On September 4th 2015, there was a highly-hyped Star Wars merchandising bonanza called Force Friday. She was on clothing from Her Universe, Hot Topic, and Fifth Sun. The Halloween costume came out. She was one regular Hasbro action figure, one Black Series figure, and one Disney Store Elite Series figure. There was the aforementioned speeder bike set. She was also a POP Vinyl figure with an additional variant that was a Hot Topic exclusive. Eventually she’d be an Itty Bitty at Hallmark and in a Lego box. Rey was even a part of a few not-Monopoly games too. Despite being in line before midnight at a participating Target for Force Friday, I barely escaped with the regular action figure. By the time I walked from the line to the end of the toy aisle, most of the pegs and shelves were emptied. Luckily for me, my significant other had scouted out the aisle from a distance, had long limbs, and knew I was hoping to just get something with Rey on it. In another state, the founder of this website, Tricia, got her lone Rey figure after a guy convinced his friend that he shouldn’t buy the girl character; according to him she wasn’t going to be important. As I headed toward the checkout lanes at my store, I passed a man with a basket full of figures. He was sorting through to discover what he’d blindly cleared off the shelves. Whether he was a collector or preparing for re-sale, I’ll never know. Over the next few days though I’d see Rey and other Force Friday items on eBay and in vendor booths at a convention – all highly marked up over their retail price. So some fans would literally be paying a price for not going out to get film-related merchandise that first weekend. A few days after Force Friday I was able to visit different stores and locations in a major metropolitan area and in general was met with mostly empty shelves. The only Rey to be found was a lone POP at a bookstore. Every few weeks or so I’d check in again. I’d hear word of releases of a smattering of inventory on Amazon or in various stores across the country from time to time. If there was a lot of restocking near me, I didn’t see it. All this before we even knew how awesome Rey would be. Well maybe I knew. I at least hoped. Outside of a midnight merchandising run, I was about as ground-floor entry onto Team Rey as a general member of the public could be. Just seeing the first glimpses of her in the November 2014 teaser trailer inspired me. By December of that year I started the process of recreating her costume – all based on two teaser screenshots, both from the same side. My costume had its public debut at Star Wars Celebration Anaheim and ever since I’ve been a Rey magnet. At various conventions as well as online people have told me about their excitement for her, who they hoped she’d be, what they hoped she’d do, and questions they had about her. First it was little girls who’d run up to me and hug me, telling me they already loved Rey. Then as the year went on and little by little more images or tidbits would come out, little boys started running up to me when I was in costume too. I wonder if any of their parents were able to get something for them during that pre-The Force Awakens surge. It would seem the early bird got the worm, or at least got a chance at one. But when that merchandise came out, so many people who’d later come to love Rey too still didn’t know they’d want that merchandise. I know because I met many of them as well. For all those people – male and female, young and old – who were excited about Rey, there were a lot more who didn’t know who she was, hadn’t even heard of her. Some of these people were even wearing Star Wars shirts when they told me this. It wasn’t solely because those people hadn’t been following every bit of news. As we learned with the Rey Monopoly Debacle, licensees were deliberately attempting to hide the ball when it came to Rey. It would seem J.J. Abrams’ love of the mystery box was infectious inside Lucasfilm, Disney, and companies like Hasbro. And you know what? That was their storytelling decision to make. The logic may not have always followed though. How Rey being the literal Queen piece of The Resistance, opposite Kylo Ren as the Queen token of the First Order in a The Force Awakens chess set – a game in which the figures face off against each other in, for all intents and purposes, a battle – was not spoiling anything, but including her as a token in a game about property acquisition where tokens don’t interact with each other at all somehow would give away everything is still a mystery to me. Merchandising and marketing are a form of storytelling too. As someone who has loved Star Wars most of her life while also spending over a decade studying and working in marketing, public relations, and general communication, I’m always paying close attention to those choices. What I heard from VIPs including Kathleen Kennedy, J.J. Abrams, and even Daisy Ridley was that Rey was integral to this new story. What I saw from the magazine features, behind the scenes clips, and both posters for the movie was that Rey was a big deal. Even when it wasn’t spelled out, it was there symbolically. On the other hand, the pre-movie merchandise basically just said she was one of several characters in the movie. It said Rey was on some ladies’ clothing items because she was a girl and so some girls might want to wear something with her image. (A few guys before the movie and several more since have asked me where they could find apparel with Rey on it for them. I had to enlist help and we found very few options.) So I got the message that the powers that be in licensing thought more guys would be into BB-8 than Rey. And then there was Kylo. Regardless of that Kylo Ren’s helmet replaced Darth Vader’s and the stormtrooper with the firebird painted on it on all new Star Wars product packaging, which should have made him the most recognizable new character to the merchandising-buying public. Star Wars has a previous history for that kind of move; it wasn’t surprising Rey wasn’t there. 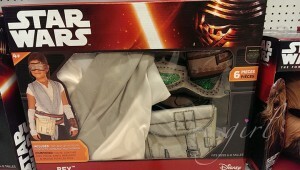 Lucasfilm uses helmets on packaging as symbols, not faces. So in a way beyond that some of this mixed messaging could be explained away with the hiding of the (Rey) ball. What would really matter would be what story the merchandise would tell when all bets were off. And? 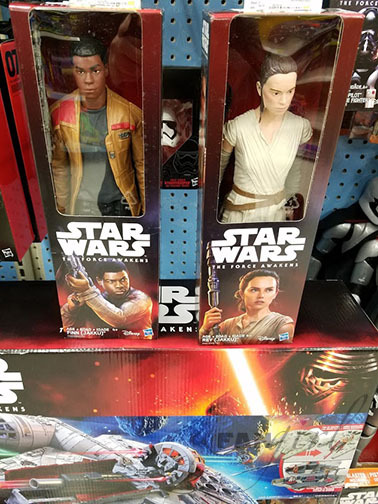 We saw a resurgence of #WheresRey, a social media hashtag that had first made an appearance when a Target-exclusive doll set of new movie characters didn’t include her. 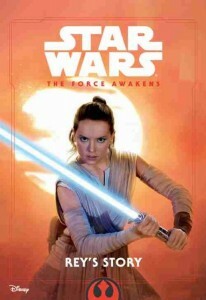 Once The Force Awakens was out, the film confirmed Rey’s awesomeness and importance. You didn’t have to be an early Rey adopter to be excited now. And so the number of people of all ages on Team Rey grew. Yes, there was a lot of repeat viewings going on, but the box office numbers cascaded as viewers were swept up in a galaxy far, far away once again or for the first time. People who’d never seen a Star Wars movie before were joining in on the joy. For thousands upon thousands of children, this became “their Star Wars”. And for so many people (this blog being just one example), the movie isn’t enough. You want Star Wars to be incorporated into your life in other ways. Maybe you feel empowered by your favorite character. Maybe you want something tangible to continue the excitement, to prolong the experience. But, most likely, if you brought yourself and/or your child to a store right after attending a showing of The Force Awakens, you didn’t have much to choose from. Online you might have had a bit more of a selection. The Disney Store’s website has been the best bet to find Rey merchandise in stock at non-hiked-up prices. But who really wants to pay for shipping and then wait 5-7 business days for your magical talisman to arrive to prolong your experience? Which brings me back to my lightsaber quest. You see, Rey uses the hero lightsaber in The Force Awakens. So it isn’t a stretch to think people are going to want that lightsaber after seeing The Force Awakens. On December 23rd, I spotted an addition to the Disney Store’s online catalogue: a blue lightsaber that was called Rey’s Lightsaber. Full disclosure: I cried a little when I saw it. There was no fanfare on the store site about it and the movie had been out less than a week, so I shared the news on Twitter while keeping my wording spoiler-free. Immediately people who read my tweet went to check it out and watching the joy spread in replies and retweets was fantastic. For those of us who’d grown up wishing there was an official female character’s lightsaber we could own, it meant so much more. It was holiday time though and I wasn’t going to go brave any shopping center to check if the physical Disney Store had them too. Budgets had been spent as well and I figured as more time went on, there would probably be more availability. Besides I was waiting for a fancier Force FX version of Rey’s lightsaber. There had to be one coming soon, right? Then in January I was invited to portray Rey in a photoshoot inspired by that very lightsaber’s scene. Kylo’s Force FX lightsaber had been out since Force Friday (at varying levels of stock). But there was no word on a Rey one. For the purposes of the shoot, I was willing to have a lightsaber that didn’t come in a box with Rey’s name on it. So we went out to pick up Luke Skywalker’s The Empire Strikes Back Force FX saber. Someone told me that Hasbro had actually released that Luke saber and a few others earlier in 2015 as part of the movie ramp-up. Except post-movie release, no stores had them in stock – not even the ones Hasbro’s website said did. Inquiring with a Barnes and Noble employee led to the discovery that none of their stores would be getting any more of that blue Luke lightsaber. Their system actually said they weren’t going to be selling it anymore. The whole time we’d been keeping an eye out for a toy blue lightsaber with the correct handle too. It wasn’t my first choice but I wasn’t going to let my standards leave me pantomiming out in the snow. After six different stores… nothing. Not even Anakin’s lightsaber. Finally I had a chance to get to a Disney Store. I walked up to see a giant The Force Awakens poster on the wall, Rey prominently central and ready for action, and then… a wall of Kylo Ren toys. Kylo figures with his helmet on, Kylo figures with his helmet off, Kylo helmets, a smattering of First Order Stormtrooper figures, and Captain Phasma’s helmet all stood before me. On each side bins full of Kylo Ren lightsabers stabbed out into the air. Looking up, there was a small mannequin wearing a kids’ Rey costume, but behind the wall were hangers filled with Kylo and Phasma costumes. 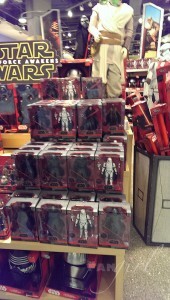 More bins filled with red lightsabers were near a couple sets of that Rey costume that sat on a side rack. Kylo sabers were hanging up too. On the opposite side was The Force Awakens figure playset that included Rey among others, at adult eye-level. A whole bunch of BB-8 merchandise… And then at the back of the Star Wars quadrant, facing the back of the store, was the rest of the Rey inventory: a few of the Rey pajama set, less than a handful of Rey t-shirts, and a couple more of that multi-character playset (these hovering right above the floor). Now I understand merchandising display to a certain degree. The Disney Store wouldn’t want it to look like they didn’t have Star Wars products, so they wouldn’t and couldn’t put something they had low or no inventory of out in front. But I kept looking back at that giant poster and the dischord felt weird. I went back to the saber hanging racks and sorted through each saber bin. I found several Darth Vader lightsabers mixed in with the Kylos. Zero blue lightsabers. Hoping they had more in back, I asked a cast member. After going through all the lightsaber locations too, coming up empty-handed, she told me they’d only been getting in a few at a time and they sell out immediately. Meanwhile at least 50 Kylo Ren lightsabers taunted me with their availability. The cast member shared that they didn’t know when the next shipment would have more Rey lightsabers and my best bet would be to just keep coming back to the store and checking. Or they could help me place an order on the website if it was still in stock there. Even with my photoshoot being pushed back a week time was running low for my case and I wasn’t particularly enthused over the cost of shipping which would up the price of the saber by nearly 50% – more if I wasn’t okay with waiting 7-10 days. In a way that feels like a kind of a surtax for liking the lead hero of a movie. So I would call multiple Disney Stores each day, only to be told there were no Rey lightsabers to be had. Luckily for the photoshoot a 501st member who had bought the right fancy Luke lightsaber some years ago leant me his. It was kind of meta. But I still wanted one of my own. More than two months after the movie’s release I’d still heard no word of a Force FX version and I hadn’t been able to find the Hasbro one in any other stores that sell Star Wars toys, so I kept calling Disney Stores although with less frequency. I couldn’t keep that up. And I couldn’t help but think I shouldn’t have to. I think of all the kids who want that lightsaber too. Are their parents supposed to call in everyday for a chance of buying one? Should kids like Carrie Goldman’s daughter have to write a letter to a toy company and have it go viral in order to be able to play a representation of a movie’s lead character in a board game that’s marketed like it’s themed to that movie? Should a group of women feel the need to plan a #ReyDay2016 to show they love a character and would like to buy more merchandise related to her if only some kind company would let them? Much of the Rey merchandise that came out back in September doesn’t seem to be available any more – at least not in stores. In January FiveThirtyEight did a count analysis of The Force Awakens merchandise available on the Toys R Us website and found that bad guys were generally better represented than the good guys which also included Phasma having more representation than Rey. My own quick search on the Disney Store website in late February revealed 33 results for Rey (although several results were products that featured the poster artwork and were not Rey-specific), 20 for Phasma, and 53 for Kylo. Over a month after the movie’s release, the Disney Store’s online depot seemed to be the Niima Outpost in a vast Jakkuian desert. It was the only way I’ve seen the Rey Elite Series Die Cast Figure with the lightsaber that came out after the movie. It’s better than nothing, but is only moderately helpful to the impulse buy inspired by a strong female lead stirring imagination. An article over at Sweatpants and Coffee claims licensees were told that boys don’t want to buy things that have girls on them. Tricia has mentioned hearing the same thing. If that’s true, there is clearly some old-fashioned thinking that has taken deep roots over at Lucasfilm. Small children are generally a blank slate. They tend not to form biases until someone teaches them to. There will be a lot of boys out there who won’t have a problem with Rey until someone tells them the should – or a toy company tells them she’s not worthy. In fact in a February 2016 Reuters article it’s established from the first sentence that Hasbro still considers Star Wars to be in their toys for boys category. I have to wonder if they have the numbers internally for how many of those Star Wars toys (part of the toys for boys that made up 40% of Hasbro’s revenue last year) did not actually go to their intended young boy market. Because when you categorize like that everyone else buying it is a bonus. So it’s not difficult to imagine that finding Rey somewhat elusive in merchandising wasn’t entirely that mystery box thing. If Star Wars products are mainly being aimed at young boys and if those involved in licensing decisions believe boys don’t want things with girls on them and their main goal is to make money then… This is probably the kind of thinking that lead to Black Widow being replaced in the toy that represented one of her most badass scenes in Avengers: Age of Ultron. And let’s not forget 2014’s #WheresGamora. While probably not every single boy who watched The Force Awakens liked Rey, a lot of them did. The character has shown a wide appeal. And as Mike Adamick points out in his blog post, Rey is a role model for boys. You can hear an example of this on Dragonfly Ripple. 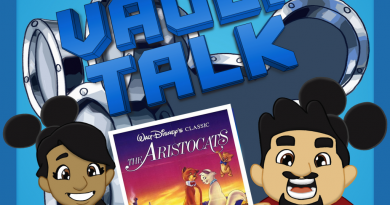 Carlin Trammel and Michael May host this podcast with their kids. When they talked about Rey, Carlin’s daughter didn’t seem to understand why her dad was making a big deal out of the character. A female character doing what Rey does probably isn’t all that new to the imagination of a girl who loves Doctor Who. Meanwhile you can hear the love for Rey in the voices of the show’s ten-year-old and seven-year-old boys. They speak about her with exclamation points. Michael recently told me about how he and his son, David, were in a Target and came across that aforementioned exclusive The Force Awakens figure set. Neither of them had seen it before and father and son were both puzzled and disappointed by her exclusion. Every time I come across a 12” Finn doll in a store (which is nearly every time I look at the Star Wars toys in stores these days), I think about kids like David. Who was that 12” Finn supposed to hang out with? 12” Kylo Ren? Certainly not the character Finn spends the most time with in the movie. There was no 12” Rey released in September or October or November or December or January or February. It’s allegedly coming from Hasbro, but as of this posting, it’s not even on the Hasbro website. There’s a much fancier 12” Rey coming from Hot Toys, but not until July 30th. The 12” Hasbro Rey was actually part of an announcement in mid-January 2016 where fans were told there was more Rey on the way. Items were to include a Nerf blaster, a LEGO buildable Rey, a 20” BIG-FIGS, a Hasbro Bladebuilders lightsaber, a Hot Wheels Rey Speeder, a Galactic Heroes two-pack with Phasma, a 3.75” Resistance outfit Rey action figure, and as part of a set of nesting dolls. It came after the resurgence of #WheresRey on social media. Lucasfilm’s Head of Licensing Paul Southern said in an article on EW.com that “The timing is good to try to address some of the social discussion that has been created through the ‘Where’s Rey?’ movement.” Lucky might be a good word for it too since Southern also indicated they’d underestimated the enthusiasm for Rey. You know, the new lead hero of their movie. It’s not like fans speaking up truly caused Rey to be in the second wave of merchandise though. These things are planned well in advance of a movie’s release. And that’s not just true for Star Wars. A giant example of this is all the must-have toys that people are scrambling for every December. You’ll notice the biggest toy fairs happen early in the calendar year and then in summer. This is when companies are showing retailers their products and often when retailers are ordering inventory. Products meant to be sold in December are usually sent to stores around October. For Force Friday items were put on sale in early September so those needed to be shipped out around July. Of course manufacturing runs have to happen before products can be sent. Final sign-offs by licensors and licensees have to happen before that. Prototypes have to be made before anyone can sign off on them. Designers have to design something in order for prototypes to be made. Teams have to come up with, deliberate, and get initial buy-in on concepts, messaging, and goals from a tangle of stake-holders before we can get to that. And usually none of this happens quickly. Annie Rose’s January 3, 2016 letter gained enough traction that J.J. Abrams started making calls. 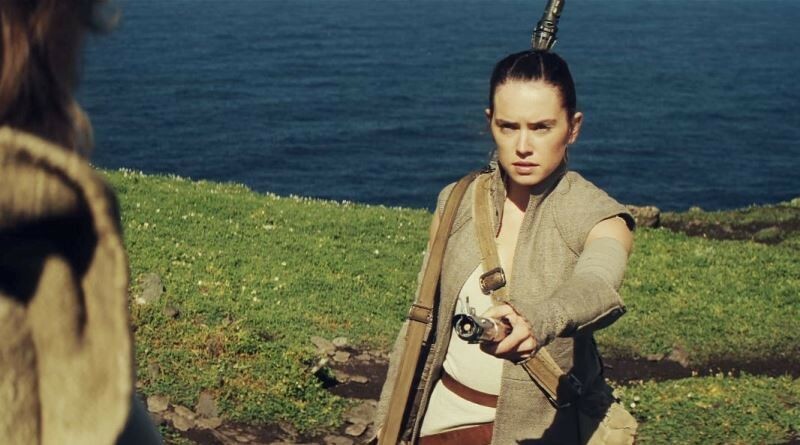 By January 6th, Hasbro announced a Rey figured would be included in the Monopoly: Star Wars game later that year. The game was initially released in September of 2015. It can take time for fans to notice en masse there’s an issue. If Abrams’ intervention factored in, and it most likely did, who knows how long it would have taken Hasbro to make a change without it? But even with how fast the announcement came, it still takes time for the change to become tangible. The new Monopoly figure was shown a month and a half later at New York City’s Toy Fair. It’ll be available in the game in the fall. So if you didn’t like the incongruence between the story Star Wars audiences were told in the movie The Force Awakens and the story the merchandise from The Force Awakens told the same people, now is the time to speak up. It’s possible that it’s too late to influence the way Rogue One is merchandised, but it’s conceivable that in some ways shifts can be made. Even more hope can be had for merchandising changes for Star Wars Episode VIII. Consumers can encourage those brave enough to change the status quo to take the leap. But be aware of the tide you are swimming against. Beyond the ingrained marketing attitudes, and beyond the very long retail planning calendar there is finding out who you should be talking to. And therein lies another rub. Often the more the average consumer tries to figure out where the questionable decisions are being made the more frustrating this gets. How much of it is the retailers? How much of it is the manufacturers? And how much can be attributed to the licensee? After all that last entity has to sign off on what the manufacturers even offer the retailers. Back in the early days of #WheresHera and #WheresSabine I spotted a Star Wars Rebels toy line that I wanted to gift to some young family members, but as you can guess by the hashtag use – the ladies were missing from the offerings. Used to hearing that the female characters would come later, I reached out to the retailer to tell them about my enthusiasm for Rebels products and to ask when the last two characters would be available. After being ignored for two weeks I received a reply that they didn’t know if Sabine and Hera would ever be added. Apparently it was up to the manufacturer, but I was also told because of confidentiality I wasn’t allowed to know who that was or how to contact them. The retailer would like to sell those characters though, so if I did find them, I should let them know. Sourcing products for retailers so I can pay them to have the item seemed like a bit too much work to give a gift to two kids. Like most people I didn’t know who at Lucasfilm might be the right person to ask, so it seemed like a dead end. It was. The Star Wars Rebels TV show portrays a group of rebels as a found family, but I literally couldn’t find the complete family. The story the show tells is that those characters would never want to leave one of their own behind, but in the merchandising, they do. So I didn’t buy any of them. I wanted to share Star Wars with a young boy and girl in my life but I didn’t want either of them to think girls weren’t important. The merchandise that has treated Rey like she’s as important as anyone else has been the books. #HeresRey has been apropos to the adult and junior novelizations of The Force Awakens, Before the Awakening, Rey’s Survival Guide, and a young reader’s book I highly recommend called Rey’s Story. It’s unfortunate that the we-were-holding-off-on-Rey-until-the-second-wave-to-protect-you-from-spoilers-even-though-we-could-have-done-stuff-like-released-a-lightsaber-for-a-12”-doll-as-an-accessory-later of the other merchandise perpetuates the wait for it/females are secondary subtext. It’s also unfortunate that outside of the books it wasn’t clearly communicated when to expect any of these second wave products. Musician Jeordie White was told at a Walmart that too much remaining Star Wars stock (like the every-present peg warmer and non-movie-entity Constable Zuvio) is preventing new merchandise from going on the shelves at that location. Back during the The Force Awakens Global Press Day in early December several attendees sent me photos of all the Rey merchandise that was on display. But I still haven’t seen several of those items announced anywhere or publicly available. Of the January announced items, I’ve found the LEGO buildable figurines for the first time towards the end of February and before that Rey’s NERF blaster in stores. And while there was plenty of Rey art being sold, at the last convention I went to in March, I didn’t even see any of the second wave Rey merchandise marked up on the show floor. The first time I found it, there was only one Rey blaster at the store. The second time the displays had been changed and there were two of her blaster, but they were hidden behind 3x as many Han Solo blasters with another Han blaster laid on top for extra camouflage. I brushed it off as a fluke until I saw them displayed the same way at another retailer – Rey sharing the same shelf slot with Han, but hidden behind him. 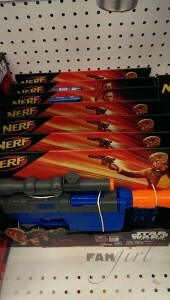 Meanwhile the NERF stormtrooper blaster was not only more prominently displayed but also on several pegs worth of slots. 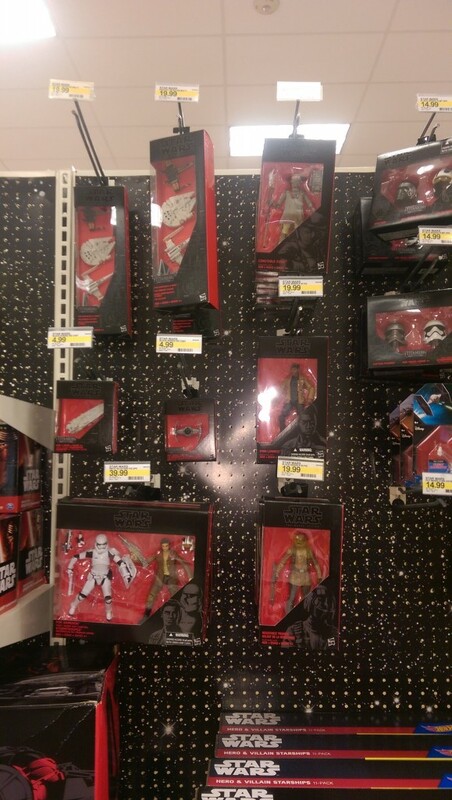 I find myself asking again – Did they get less inventory of the Rey product? Or did the Rey product just sell faster than the other two? But then I look at the bar codes. One says Stormtrooper Blaster. The other says Episode VII Blaster. There are no other NERF blaster bar codes. Rey’s slot is meant to be shared. There have been lows in the story product is telling us about Rey. There have been a couple highs: Rey is finally shown with a lightsaber in the Disney Store, Rey and Finn have replaced Kylo Ren on the Disney Store online banner for the Star Wars section, and more and more fans are sharing on social media Rey merchandise spotted in the wild. It’s been frustrating as a consumer and a fan. As March closes out there seems to be a turn for better availability. But it’s hard to forget that in some ways Rey is still being hidden. In the very end of January the online Disney Store offered a promotion that would give free shipping with the purchase of any Star Wars product. I went ahead and ordered my Rey lightsaber. As pleasant as all the employees were, I was tired of checking in with the stores. After not having the time to call one day and finding out the next that a store had received and sold out of the few that came in in that one day, I was frustrated. And I was afraid the situation was going to devolve into that Elsa Costume Absurdity of 2014 where you’d have to come to the store on a Saturday morning and basically enter a raffle for an opportunity to purchase in-demand but understocked merchandise. After my lightsaber arrived in February, the online store offered a different promotion. I went to check to see if it was a better deal and found the lightsaber was out of stock online too. The listing came back several days later. I’m now hearing that a new blue hero lightsaber Force FX version will be coming out in September 2016–9 months after the film’s release… under the name Luke Skywalker. Update – April 5, 2016: For the first time I found a 12″ Rey in a store. It was at a Walmart, there was only one, and I immediately put Rey and Finn next to each other on the shelf so they could hang out. Just from looking at it in the box, the quality leaves something to be desired. The artwork is very nice though. Also we now have a link to a listing on Hasbro’s site (h/t to Yakface). If you find Rey merchandise in stores, feel free to comment below with what item and the name of the store it was found at. On social media, use #HeresRey to share your Rey discoveries. 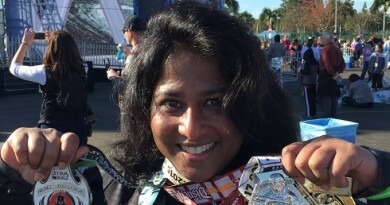 Star Wars Inaugural Half Marathon: Do or Do Not!